UNITED NATIONS, December 10 -- Tour guides at the UN, after a two day sick-out in protest of working conditions, reached an interim agreement with UN management late Friday night. Tours resumed on Sunday, and the first negotiating session under the more representative format demanded by the guides is scheduled to take place Tuesday. 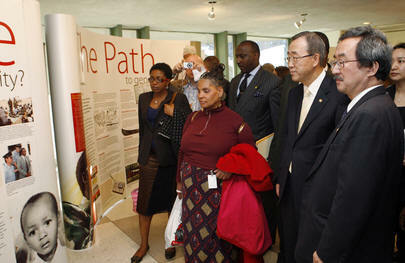 Preceding the late-night agreement, hammered out between the Department of Public Information's office on the tenth floor and the Staff Union's fifth floor conference room, was a unplanned dialogue between tuxedoed Secretary-General Ban Ki-moon and one of the tour guides, who in Korean told Mr. Ban that his intervention was needed. This took place on the sidelines of the UN Correspondents' Association ball, after a cocktail hour replete with canapes and an array of ambassadors, from Dumisani Kumalo of South Africa to Wang Guanya of China. Backchannel via leaked e-mail, the tour guides told Mr. Akasaka, "We insist that the six individuals on the list submitted by us will not merely be advisors, but be there to represent us, with full right to participate and speak on our behalf." -Netta Avedon, OHRM; Lena Dissin, DM; Marry Ferreira and Mampela Mpela, staff representatives of DPI; Elizabeth Baldwin-Penn and Isabelle Broyer, Public Relations section, Louis German, DPI; and up to three representatives of the part-time Tour Guides." "You may interpret your delegation members as you see fit. Any member of your delegation is free to speak, of course. The most important thing is to start our dialogue, in the interest of our tour guides and of our organization. I look forward to seeing you next Tuesday." And on that basis, the guides returned to work on Sunday, and tours resumed. Tours of UN headquarters are a source of profit to the UN. Budget documents show that in 2006-07, "services to visitors" at headquarters generated gross revenue over $ 8 million, with $736,600 of that being net revenue. As one participant put it, the guides have the lowest pay, and least security, in UN headquarters, and yet had the courage to take this job action. There are those who say it may be spreading.